The Space Robotics Technical Committee has two main areas of interest: Microgravity and Planetary Robotics. 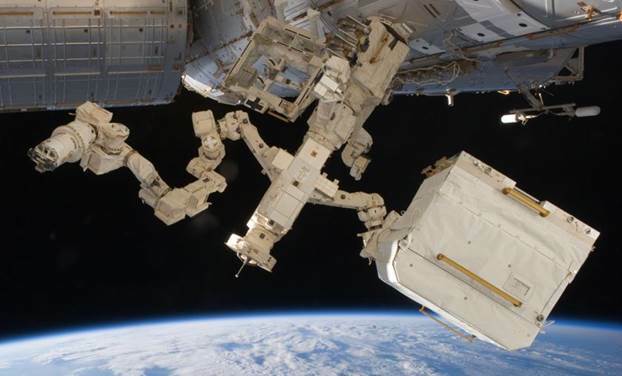 Microgravity Robotics includes manipulation and mobility for scenarios such as International Space Station (ISS) operations and satellite servicing. Planetary Robot systems address scenarios such as Mars and lunar exploration using manipulation or mobility on or near the surface. Some scenarios, such as asteroid and comet exploration, have environments with low gravity which may blur the distinctions between these categories. • Electromechanical design and control. • Machine vision for inspection and assembly, including compensation for stark lighting, glare, glint, and deep shadows. • Command and control interfaces, including teleoperated modes. • Power sources and consumable recharging techniques. • Radiation hardening and effects on processing throughput. • Thermal considerations in space robot design. • JAXA ETS-VII (1997-1999) – first satellite to be equipped with a robotic arm. • CSA Canadarm 2 (2001) – service crane for the ISS assembly and maintenance. • MIT SPHERES (2006-present) – internal microsatellite testbeds aboard ISS. • JAXA JEM-RMS (2009) – service arm on ISS. • DARPA Orbital Express (2007) – autonomous satellite grappling. • NASA GSFC Robotic Refueling Mission (2013) – ISS manipulation experiments. • NASA Raven (2016) – ISS autonomous navigation and guidance system technology demonstrator. • NASA Restore-L (2020) –satellite refueling mission. • DARPA Phoenix Mission (2020) – multiple satellite repairs. • NASA ARM (2020) – Asteroid Redirect Mission. NASA’s “Curiosity” Rover operating on Mars. • Sensing and perception for planetary exploration, including terrain-relative precision position estimation. • Above-surface, surface, and sub-surface planetary mobility, possibly from novel vehicle design concepts. • Command and control with limited bandwidth, often precluding teleoperation and requiring autonomous surface operations, with natural terrain navigation and manipulation. • Planetary rovers systems engineering. • Testing and qualification, including field tests on Earth and Mars. • Human-Robot system design and development. • NASA Pathfinder Sojourner Rover (1997) – small solar powered Mars rover experiment. • NASA MER (2003-present) – dual solar powered Mars rovers, one still alive. • JAXA Minerva (2005) – low gravity hopper for asteroid surface, but unsuccessful in reaching on the target. 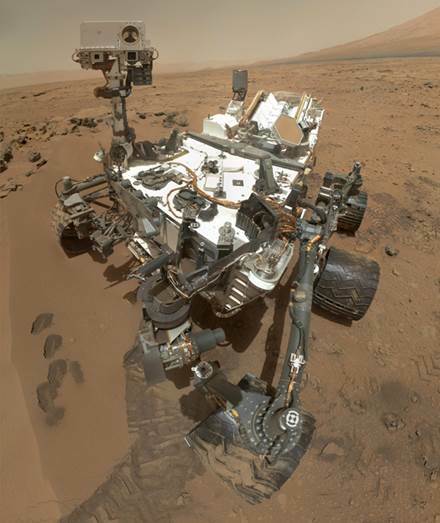 • NASA MSL (2011-present) – RTG powered Mars rover. • CNSA Chang’e 3 Yutu Rover (2013) – solar powered lunar rover. • JAXA Hayabusa-2 (2014) – carrying low gravity mobile robots for asteroid surface: Japanese MINERVA-2 and DLR/CNES MASCOT . • ESA ERA (2017) – European Robotic Arm on ISS. • JAXA SELENE-2 Rover (2018) – short duration lunar rover. • ISRO Chandrayaan-2 (2018) – carrying RKA Luna-Resurs solar powered lunar rover. • ESA ExoMars Rover (2020) – solar powered Mars rover. • NASA M2020 Rover (2020) – RTG powered Mars rover. • Google Lunar X Prize (2017) – contest for lunar exploration. • Korean Lunar Exploration (2020’s) – lunar lander and rover. • Roving – NASA JPL Robosimian, NASA JPL ATHLETE, NASA JSC SEV, CSA Rover prototypes. • Steep Terrain – NASA JPL Axel. Recent news on space robotics is available from IEEE Spectrum News on Space Robotics. 2. IEEE Aerospace Conference, Big Sky, Montana, USA, 4-11 March 2016. Special sessions, including “Robotic Mobility and Sample Acquisition Systems”. 3. Gravity Offload Testbeds for Space Robotics Mission Simulation Workshop, Full-day Workshop at the IEEE/RSJ International Conference on Intelligent Robots and Systems (IROS), Vancouver, Canada, 24 September 2017. 1. International Symposium on Artificial Intelligence, Robotics and Automation in Space (i-SAIRAS), Beijing, China, 19-22 June 2016. 2. IEEE Aerospace Conference, Big Sky, Montana, USA, 6-12 March 2016. Special session on “Robotic Mobility and Sample Acquisition Systems”. 10th Conference on Field and Service Robotics (FSR), Toronto, Canada, 24-26 June 2015. 13th Symposium on Advanced Space Technologies in Robotics and Automation, ESA/ESTEC, Noordwijk, The Netherlands, 11-13 May 2015. 3. The Next Generation of Space Robotic Servicing Technologies, Full-day Workshop at the International Conference on Robotics and Automation (ICRA), Seattle, USA, 26 May 2015. 4. IEEE Aerospace Conference, Big Sky, Montana, USA, 7-14 March 2015. Special session on “Robotic Mobility and Sample Acquisition Systems”. 1. Workshop on “Modeling, Estimation, Perception and Control of All Terrain Mobile Robots” IEEE International Conference on Robotics and Automation (ICRA), Hong Kong, China, May 2014. 2. IEEE/AIAA Aerospace Conference, Big Sky, Montana, USA, 1-8 March 2014. Special sessions, including “Mobility and Robotics Systems for In Situ Exploration”. 3. Journal of Field Robotics, Special Issue on Space Robotics. Call for papers, due 19 September 2014. 1. Space Robotics Workshop, IEEE International Conference on Robotics and Automation (ICRA), Karlsruhe, Germany, May 2013. 2. IEEE/AIAA Aerospace Conference, Big Sky, Montana, USA, 2-9 March 2013. 1. International Symposium on Artificial Intelligence, Robotics and Automation in Space (i-SAIRAS), Turin, Italy, 4-6 September 2012. 2. International Conference on Field and Service Robotics, Matsushima, Miyagi, Japan, 16-19 July 2012. 3. Long-Term Autonomy Workshop. IEEE International Conference on Robotics and Automation, St. Paul, Minnesota, 18 May 2012. 4. Satellite Servicing Workshop. IEEE International Conference on Robotics and Automation, St. Paul, Minnesota, 14 May 2012. 6. IEEE/AIAA Aerospace Conference, Big Sky, Montana, USA, 5-12 March 2012. 1. Challenges in Robotics: Down to Earth, An International Symposium on Robotics and Mechatronics, German Aerospace Center (DLR), Wessling, Germany, 21-22 November 2011. 2. Workshop on Space Robotics Simulation, IEEE/RSJ International Conference on Intelligent Robots and Systems (IROS), San Francisco, California, USA, 26 September 2011. 3. Space Robotics Workshop, IEEE International Conference on Robotics and Automation (ICRA), Shanghai, China, 13 May 2011. 4. IEEE/AIAA Aerospace Conference, Big Sky, Montana, USA, 5-12 March 2011. Special sessions, including “2.07 – Mobility and Robotics Systems for In Situ Exploration”. 1. Japan-U.S. Technology and Space Applications (JUSTSAP), Island of Hawaii, USA 14-18 November 2010. Symposium was attended by SRTC member Rick Wagner, who provided a report. 2. Planetary Rovers Workshop, IEEE International Conference on Robotics and Automation (ICRA), Anchorage AK, 3 May 2010. 3. Space Robotics TC Triennial Report, May 2010. 1. IEEE Robotics & Automation Magazine, Special Issue on Space Robotics. Editors: Richard Volpe, Rick Wagner, Gianfranco Visentin. Volume 16, No. 4. December 2009. 1. Planetary Rovers Workshop, IEEE International Conference on Robotics and Automation (ICRA), Pasadena CA, 19 May 2008. 2. Orbital Robotics Workshop, IEEE International Conference on Robotics and Automation (ICRA), Pasadena CA, 20 May 2008. 1. Space Robotics Workshop, IEEE International Conference on Robotics and Automation (ICRA), Rome Italy, 14 April 2007. 2. Presentation of the RAS Space Robotics TC to the AIAA SARTC meeting at NASA Ames Research Center on September 19, 2006. See a report on the meeting. • Richard Volpe, Jet Propulsion Laboratory, Caltech. • Kazuya Yoshida, Tohoku University. • André Schiele, Delft University of Technology. • Current membership is 28. Please see the membership page for more details. • To join, send an email to the committee chairs listed above.